Artists: do you blog? Have you considered starting one? If you have spare time, blogging can be a great way to keep in touch with the people who follow your work, and a place for new people to find you. Share the why and how behind your artwork. Show works in progress, and connect with your fans and buyers. They can keep up to date on your new work and shows by signing up for your RSS feed or an e-mail newsletter of your blog posts. Ask your readers questions, and get comments on your posts. Improve your search engine rankings and make it easier for people to find you online. That said, blogging isn’t for everyone. You should blog only if you have the time and energy, and something to say. We asked some Art League artists who blog for their perspective on everything. Read to the end for some resources that can help you with starting an artist blog and ideas for what to write about. 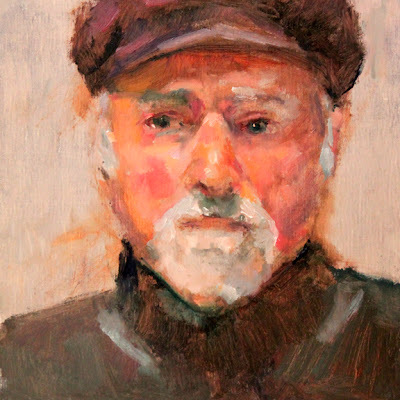 “Reston Founder Robert (Bob) Simon: Face #100” by Jill Banks. 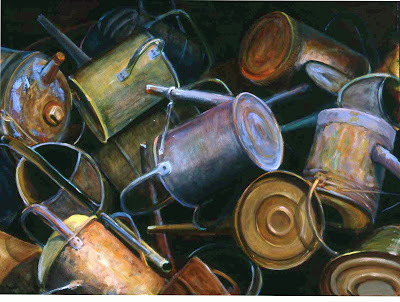 This was the final painting in Jill’s 100 Faces in 100 Days project, which was chronicled on her blog. You can read about this final piece here. “It really built a following,” Jill said of the 100 Faces chronicle. Articles like these, which allow readers to follow an ongoing project and to connect with the stories behind artwork, are perfect for artist blogs. “And Not a Drop to Drink” by Cindy Packard Richmond, from this post on her blog. Nancy Freeman says that while her blog is only one part of her site, it’s by far the most active part. She tries to update it at least twice a week. Using Weebly, the system her site is built on, has been straightforward; she says that it’s producing the content that’s been time-consuming, in particular, photographing and editing images of her artwork. “My site is a lot like a garden;” Nancy writes, “it’s more of a process than a product and is always a work in progress. And as with a garden, the rewards are in direct proportion to the time and effort you put into it.” You can read more of Nancy’s thoughts about her new website on her blog. For other examples of artist blogs, Google some of your favorite artists or check out the links to Art League blogs in the right sidebar. If you’re interested in WordPress, The Abundant Artist has many useful posts to help you — as well as other advice on websites in general. Here is their video on how to set up your site, and this post has examples of themes that work for artists. Here are six simple ideas for artist blog posts from Empty Easel. Remember, if it’s about art, and it interests you, it will interest your readers, too! Kirsty Hall has excellent articles including Different Forms of Art Blogs and Getting Started With Blogging. If you poke around on her site you’ll find lots of helpful stuff. If you have any thoughts or questions, let us know in the comments! Thanks for mentioning TAA. We’re working on a blog post covering a series of successful artists who blog well.